PORTLAND, Ore.— Conservation organizations are bolstering a U.S. Fish and Wildlife Services reward for information on the illegal killing of OR-25, a federally protected gray wolf in southwestern Oregon. The Service has offered a $5,000 reward, and six conservation organizations have contributed an additional $11,750. In the past two weeks alone, state and federal officials have announced the poaching deaths of wolves OR-25 and OR-33 near Fort Klamath and Klamath Falls, where wolves still have federal protection. In addition to these two kills, since state endangered species act protections were removed from Oregon wolves across the state in late 2015, at least an additional seven wolves have been poached or died under mysterious circumstances in Oregon. 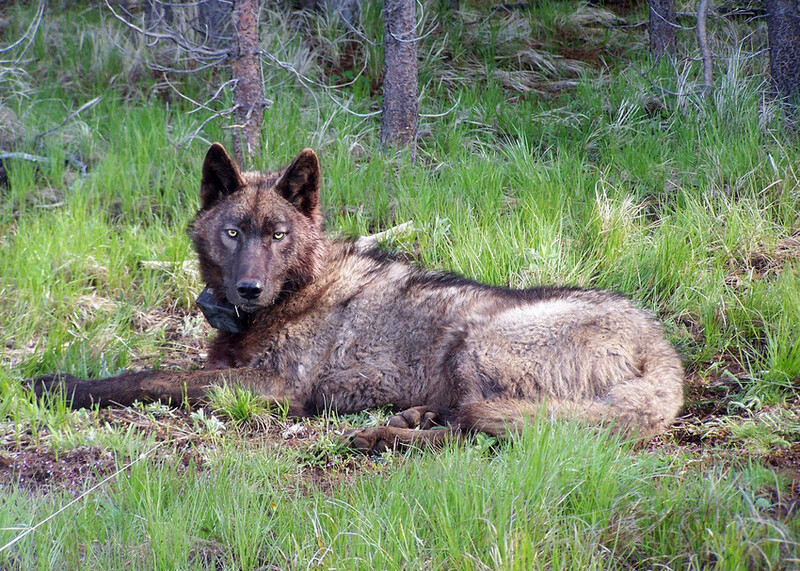 At the time of state delisting, conservation groups warned the Oregon Fish and Wildlife Commission that scientific research shows removing protection from wolves, as well as increased wolf-killing by agencies or the public, decreases social tolerance for wolves and increases incidences of poaching. "Wolf poaching, surreptitious or flagrant, is a growing phenomenon in Oregon,” said Wally Sykes, cofounder of Northeast Oregon Ecosystems. “I hope the rewards now on offer for information identifying these people will bring results. Oregonians overwhelmingly value and respect wolves, but these criminals will kill them out of ignorance and malice." "Despite massive public objection, the state has made countless efforts to accommodate commercial livestock interests by delisting wolves and shooting wolves all in the name of building 'social tolerance' in rural Oregon,” said Nick Cady, legal director for Cascadia Wildlands. “Instead of building tolerance for wolves in these communities, it appears these efforts have only given social license to killing wolves in violation of the law." Anyone with information about this case should call the U.S. Fish and Wildlife Service at (503) 682-6131 or Oregon State Police Tip Line at (800) 452-7888. Callers may remain anonymous. OR-25 was found killed near Fort Klamath in the Sun Pass State Forest on Oct. 29. Details about this illegal killing, though not the precise cause of death, were released Nov. 6. OR-25 was a 4.5-year-old male gray wolf who was collared in May 2014 and separated from the Imnaha pack in northeast Oregon in March 2015. Like famous wolf OR-7, also of the Imnaha pack, OR-25 made his way across Oregon into California, where he spent several weeks in December 2015 and January 2016 roaming in Modoc County, presumably in search of a mate. He returned to Oregon and had been living in the Klamath County area since that time. Killing a gray wolf in the western two-thirds of Oregon is a violation of the Endangered Species Act. It is also a violation of Oregon state game laws and is subject to both criminal and civil penalties. The investigation of this crime is being conducted by the Oregon State Police and the Fish and Wildlife Service. The announcement of the poaching death of OR-25 arrives on the heels of the killing of another Oregon wolf last week by an elk hunter in the eastern part of the state, in Union County. The hunter has claimed the wolf was coming directly at him and that he killed the animal in self-defense, despite clear evidence the wolf was shot in the side on the midsection of its torso. Though the hunter’s story conflicts with the physical evidence, state and county officials are declining to press charges. Photo of OR-25 courtesy Oregon Department of Fish and Wildlife. This image is available for media use. The Center for Biological Diversity is a national, nonprofit conservation organization with more than 1.5 million members and online activists dedicated to the protection of endangered species and wild places. Recognizing the ecological importance of wolves, bears and other carnivores, the Center uses science-based advocacy to defend these magnificent animals from persecution, exploitation and extinction. Find out more about our Carnivore Conservation campaign here. Northeast Oregon Ecosystems supports work to restore and expand wildlife habitat and watersheds. Defenders of Wildlife is dedicated to the protection of all native animals and plants in their natural communities. With nearly 1.2 million members and activists, Defenders of Wildlife is a leading advocate for innovative solutions to safeguard our wildlife heritage for generations to come. For more information, visit http://newsroom.defenders.org and follow us on Twitter @DefendersNews. Cascadia Wildlands defends and restores Cascadia’s wild ecosystems in the forests, in the courts, and in the streets. We envision vast old-growth forests, rivers full of salmon, wolves howling in the backcountry, and vibrant communities sustained by the unique landscapes of the Cascadia bioregion. Join our movement today.